"This laboratory is at the heart of making sure that NIST Boulder has the capabilities it needs to carry out its critical mission," Gallagher said. "The work that's done here is central to the role of NIST. The work done here on atomic clocks, on voltage standards, on quantum computing, on detectors—this is the essence of NIST's role to define and implement a system of measurement to the benefit of the United States. And it's a mission that is as fresh today as it was in 1901 when this agency was first founded. So I think our best is still to come, and it's exciting to know we'll have a home like this in which to do it." Stella Fiotes, NIST's chief facilities management officer, noted that planning, design and construction of the PML required six years of sustained leadership and collaboration to ensure completion on time, within the budget, and with a strong safety record. "This beautiful facility provides a dramatic improvement over the existing facilities located on the NIST-Boulder campus," Fiotes said. 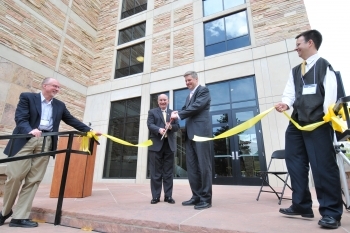 At the JILA ceremony on the CU-Boulder campus, Gallagher said the new X-Wing will deepen and refresh NIST's productive partnership with the university. He noted that JILA supports NIST efforts to promote technology transfer by generating new measurement tools and training young innovators who go on to advance measurement science, found high-tech companies and win Nobel prizes. "JILA started out, frankly, as a unique experiment 50 years ago, a pioneering partnership bringing together federal scientists and university researchers within the same organization," Gallagher said. "It's been an experiment that has had remarkable success, beyond even the original vision of the founders. It's been so successful, in fact, it has served as a model for all other successful university/government partnerships, not just at NIST, but also at a number of other agencies and universities." JILA/NIST Fellow and Nobel laureate Eric Cornell, who served as master of ceremonies for the X-Wing dedication, noted that JILA had outgrown its original building. "JILA was a victim of its own success. We really needed to expand, we really needed to modernize, we really needed the X-Wing," Cornell said. For more information about the PML, see the fact sheet at: http://www.nist.gov/public_affairs/factsheet/pmlboulder-brochure.cfm. A CU news release about the JILA X-Wing, as well as videos and fact sheets, is available at: http://colorado.edu/news/series/jila-joint-institute-cu-and-nist.